"Well, that finished him as a lawyer, at least a working lawyer. And some of it mayhave been my fault. Perhaps I was not the kind of friend in court that Lazlo needed." I feel uncomfortable reviewing a Hunter S. Thompson movie without copious amounts of liquor anddrugs and some heavy weaponry by my side, but I'll try to soldier on as best I can. 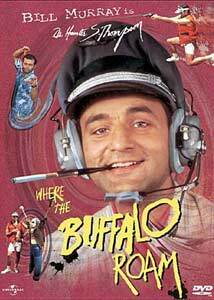 Where the Buffalo Roam is a picture of the drug and alcohol-addled adventures of gonzojournalist Hunter S. Thompson (Bill Murray) and his attorney, Carl Lazlo (Peter Boyle). Based onThompson's eulogy for his real-life attorney Oscar Acosta in Rolling Stone, "The BansheeScreams for Buffalo Meat," the film covers the years 1968 to 1972 from Thompson'sperspective. We first meet Lazlo as he defends drug defendants in San Francisco. When Thompsonshows up to write an article about Lazlo the court soon erupts into chaos and Lazlo finds himself injail. Thompson keeps getting assignments from long-suffering editor Marty Lewis (a suitablyneurotic Bruno Kirby), from the Super Bowl in 1972 to the presidential campaign trail. Lazlo keepsshowing up unexpectedly, with ever more bizarre plans, including gunrunning and setting up a drug-fueled republic out in the desert. When Hunter S. Thompson is your voice of reason, you knowyou're waaaaay off the deep end. Boyle is excellent as Lazlo, with conviction burning from the get-go that believably develops intoobsession and mania. Murray is disappointing as Thompson, restricted to doing a halfhearted versionof his usual shtick. He makes Thompson come across as a complete fraud. Craig T. Nelson has anamusing cameo as a twitchy cop being cross-examined by Lazlo. The film is littered with referencesto Thompson, such as graffiti on a wall which reads "Fear and Loathing", which proves moredistracting than humorous. The film doesn't work too well as a comedy, especially at a distance of two decades, relying toomuch on sophomoric drug and alcohol humor that isn't even that good to begin with. One funny butclichéd bit along those lines involves Thompson giving the uptight reporter Harris, of the Post (ReneAuberjonois), unspecified drugs as a headache remedy: "I've never had any complaints about theblue ones." Harris soon dissolves into an ecstasy of giggling and Lucy in the Sky with Diamonds. While masquerading as Harris, Thompson manages to have a completely whacked-out interview withRichard Nixon in a mens' room. In all, this is a rather disappointing picture. For some reason, Hunter S. Thompson sounds like he'dbe a pretty funny subject for a movie, but he really isn't. If Bill Murray can't make a guy look funny,well, then he's best off with copious amounts of drugs and liquor. Image Transfer Review: Anchor Bay's anamorphic transfer is quite good. The opening stock footage of buffaloes is soft andgrainy but the feature proper is sharp and crisp with good colors and excellent detail. Blacks are aboutaverage. The source print is impeccable and looks gorgeous throughout. Video bitrates run between6 and 7 Mbps through much of the film. Audio Transfer Review: The 2.0 mono sound is perfectly adequate for this dialogue-heavy film. The gunshots come acrossa little weak, but there is no hiss or distortion to be heard in either the dialogue or the Neil Youngscore. Extras Review: The sole extra is an extensive biography of Thompson, who also acted as consultant for the film andshot off lots of guns on the set. It includes a selected bibliography. The chaptering is only fair;several of the chapters run over 15 minutes in length. No subtitles are included, as is expected fromAnchor Bay, nor is any trailer. A not-terribly-funny comedy that relies too much on drugs and alcohol to have aged very gracefully. Anchor Bay nonetheless gives it a nice anamorphic transfer so it's not likely to look any better ifyou're a fan of the film—but the appeal is limited to Thompson devotees.